SUPER cute dress! I love the bow! I cannot deal with how amazing this is; you look stunning. This dress is adorable! I love the bow detail. I've never bought anything from Spiegel before, but now I will definitely have to check out their website! Love a LBD but those shoes!!!!!! Ah so cute! You look STUNNING! That dress is amazing, I love the texture and the big bow! So pretty on you! And the metallic shoes are such a fun touch! LOVE that big bow! SO cute!! Love love love that dress!! It's so ladylike and flattering! HOW did I miss THIS DRESS? You look adorable lady! What a feminine but classy dress! I absolutely love the old school Hollywood shape of it! Suits you perfectly! I need this dress. Will definitely need to borrow this from you! Such a cute and classic dress! This dress is so gorgeous and I just love your metallic shoes! You look stunning. That dress is amazing! I love the bow! Stunning! I love a good bow :) You look beautiful! 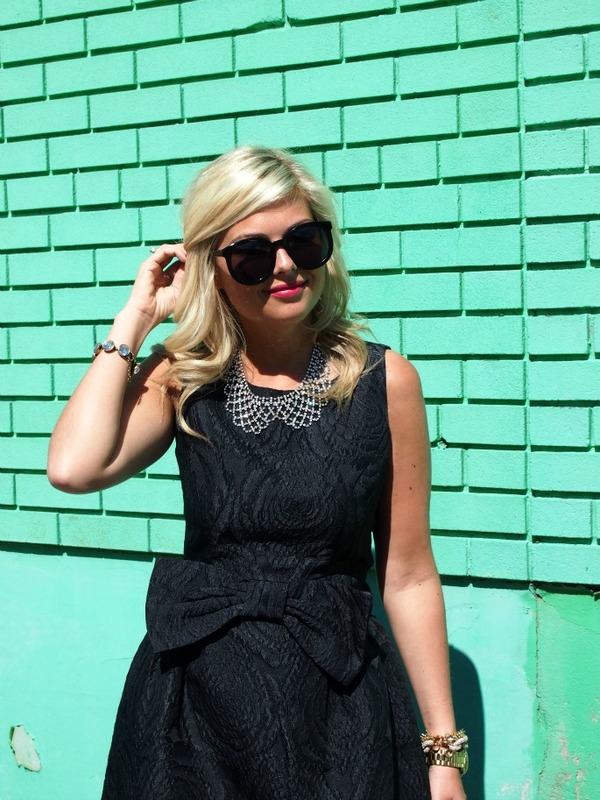 I love anything with a bow....so I am majorly obsessed with this dress! It's so fun! The bow on your dress is adorable! I love everything about this dress...the cut, fabric, the necklace your paired it with...adorable! LOVE what Spiegel's been doing with their latest! I love the re-branding. You look great! Oh wow, I love this dress! And those heels are amazing. Such a stunning dress! Love the detailing. This dress had a WOW factor and I'm sure you will get a ton of use out of it! LOVE the bow detail! J.CREW giftcard giveaway on the blog! love the giant bow and the pretty metallic shoes - i am obsessed with metallic shoes right now! Absolutely gorgeous! The dress is beautiful all the details from the texture to the bow, it's just perfect. Can't decide what I love more...the dress or the shoes! That has got to be one of the best LBD i've layed my eyes upon. The bow adds a touch of umph to it. Although I think you could have chosen a better pair of heels to go with it.